Toronto Raptors' Amir Johnson (15) tries to keep Miami Heat's Dwyane Wade (3) from the ball during the first half Sunday night. MIAMI — The Miami Heat enjoyed three wins in two nights — victories against Orlando and Toronto, and the fact Dwyane Wade played a significant amount of minutes in each. Wade, playing in back-to-back games for the first time since Nov. 15-16, scored 14 points in 34 minutes, 40 seconds to help the Heat defeat the Raptors 102-97 at AmericanAirlines Arena on Sunday night. LeBron James had 30 points and Michael Beasley added 17 off the bench for the Heat (26-8). Wade, who had 20 points in 35:58 of Saturday night’s win at the Magic, has been protective of his knees all season. After playing in consecutive nights against Dallas and at Charlotte, he missed two November games. LeBron James scores 30 points, Michael Beasley added 17 off the bench as the Heat took down the streaking Raptors. The guard, who underwent an offseason knee procedure, was very active against the Raptors and didn’t seem hindered at all. Atlantic Division-leading Toronto (16-16) entered riding a five-game winning streak and had been 9-3 since the Dec. 9 trade of Rudy Gay. Toronto dropped two November home games to Miami. Rashard Lewis second straight start for injured Heat forward Shane Battier (quad). Norris Cole started the second half for point guard Mario Chalmers, who the team said was suffering from Achilles’ tendinitis. 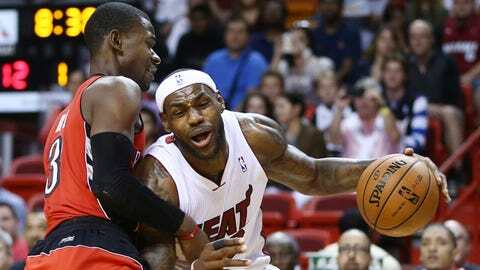 The Heat trailed 84-79 after three quarters. Miami shot 50.8 percent to that point but was just 2-of-5 from 3-point territory. The two-time defending champs then relied on defense in the fourth, holding the Raptors to 13 fourth-quarter points. Toronto scored just two points during the first 7:29 of the period. Miami led 52-51 at half. James has 16 first-half points and Beasley added 11 off the bench. Miami scored the first seven points of the third quarter to go ahead 86-84 with 8:56 left. The Heat didn’t trail after that. James, who scored 10 of his 30 points in the fourth quarter. Toronto scored just 13 points in the fourth quarter. 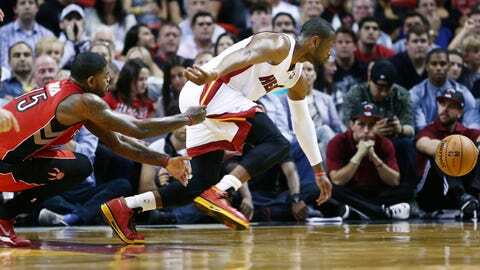 The Heat play the New Orleans Pelicans at AmericanAirlines Arena on Tuesday at 7:30 p.m.